Summer is here, and the fun is just beginning for our newest interns: Team Smiley! 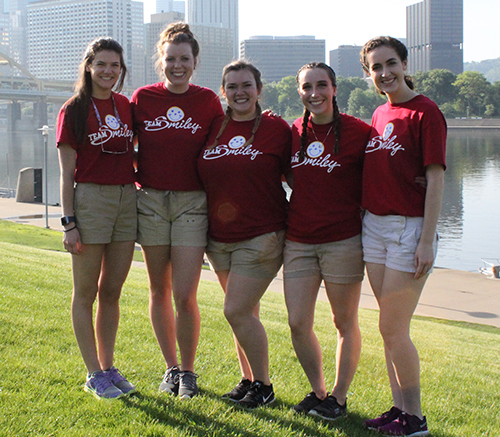 This enthusiastic crew is about to start their summer-long journey across the tri-state area, where they’ll be visiting Eat’n Park restaurants, fundraisers, festivals, races, and other community events from now through the fall. Where Team Smiley goes, fun follows. Click here to see when they’ll be visiting your neighborhood, then stop by with the family to meet Smiley and enjoy a free Smiley Cookie – or even decorate one yourself! Plus, don’t forget to follow Team Smiley on Instagram and Twitter so you don’t miss any of their summer adventures. If you happen to cross paths with them at an event, be sure to stop by and say hello! You can even check our Photo Gallery to find your photo! Hi Smiley friends! My name is Lyndsey and I traveled all the way from Wisconsin to spend my summer with Smiley and all of you! I traded in cheese for Smiley Cookies and couldn’t be more excited. I currently go to University of Wisconsin-Whitewater (Go Warhawks!) where I am studying marketing with an emphasis in retail. I love to travel so I am excited to get on the road and spread smiles all around the area this summer! My favorite meal at Eat’n Park is the Chicken and Strawberry Salad. (It’s my summer go-to for lunch!) I am so thrilled to explore Pittsburgh and all the great things that makes this city so unique! Hey y’all! My name is Gigi. Originally from southwestern Virginia, I’m a rising Senior at Duquesne University, studying Public Relations & Advertising and Digital Media Arts. Despite my southern roots, I now claim Pittsburgh as home and love living in this city. In my free time, you can catch me running on the Three Rivers Heritage Trail or hanging with friends. My favorite thing at Eat’n Park is the Soup, Salad & Fruit Bar. (Shout out to the chili!) I’m looking forward to hitting the road this summer with Team Smiley and the big, loveable cookie himself… Smiley! Hello everyone! My name is Melanie and Smiley has been a part of my life since I was a little cookie! Eating at Eat’n Park every Sunday with my Mimi and cousin, Jess, has been a family tradition of mine for as long as I can remember. I live in a small town called Russellton, which is about 40 minutes outside of Pittsburgh, and can always be spotted at my local Eat’n Park snacking on my favorite item: FarmSource Vegetable Soup! I am a junior at The Pennsylvania State University and am majoring in advertising. When I am not spreading smiles with Smiley and the team, I enjoy taking my smile out to explore local hot spots with my friends, family, and two Chinese Crested Powderpuff puppies. Hi, everyone! My name’s Kara, and I’m a junior at the University of Georgia where I am studying Advertising. I may be located in Georgia for school, but I’m a Pittsburgh girl, born and raised, so I’m excited to be back in my hometown and on Team Smiley this summer. While I’ll gladly eat anything from Eat’n Park’s menu, my absolute favorite dish is the Chicken and Strawberry Salad. As for dessert, I love a good slice of Oreo Creme Pie, although I’ll never object to having a whole pie to myself. When I’m not at Eat’n Park, you can find me baking up a storm in my kitchen or enjoying the great outdoors. I look forward to exploring new places this summer and making great memories! Hi all! My name is Taylor and I am a senior Business Marketing major at Pennsylvania State University. I grew up in the Pittsburgh area, but my family recently moved to San Antonio, Texas. Even though we moved halfway across the country, I’ll always be a ‘burgh girl at heart. In my free time, I like to hang out with friends and travel. Since my freshman year of college, I have worked for the Pittsburgh Pirates as a ballgirl so you can always catch me on the sidelines of PNC Park fielding foul balls and interacting with fans. My favorite Eat’n Park menu item is the Soup, Salad & Fruit Bar. With so many options, I never walk away disappointed! I look forward to many more trips to the Salad Bar and traveling with Team Smiley this summer!